He might not have come from a rugby stronghold, but now that he’s here Tom Daly is determined to make the most of every opportunity. The physiotherapy student is one of 12 recipients of the Goodbody Rugby Players Ireland Bursary which will aid the development and progression of players’ off-field careers and academic studies. Hailing from Carlow, Daly attended Knockbeg College where he carved out a reputation for being a decent footballer. The school’s sporting tradition, widely recognised throughout the country, has seen several past-pupils thrive across a variety of codes but it is Gaelic Football with which the school is synonymous. While honing his kicking skills near Graiguecullen, Daly was also raising eyebrows in other fields. Lining out for Carlow RFC, then flying high in Division 1 of the All-Ireland League, Daly was quickly identified as one to carry-the-can into the future as he progressed through their juvenile ranks. Whether Felipe Contepomi was reporting back to base is unknown, but in time Leinster Rugby came knocking. “It’s a bit of a weird one,” Daly makes of his chosen career. “When you tell someone you’re a professional rugby player from Carlow, they don’t really think that it’s a proper job!” Currently, Daly and the Byrne twins ensure that Sean O’Brien is never too homesick at Leinster, while aspiring to scale the same lofty heights as the Tullow man. Pragmatically, the former Men’s 7s captain acknowledges that such careers are few and far between. Several irons have therefore been cast into the fire. “When I’m working at college, I give the time that I have and go hard at that. When I’m with Leinster and training, my full focus is on rugby. I have time to switch off aswell when I’m at home chilling with the lads. That’s important – to take your mind off everything, forget about rugby, forget about college. I try to split my time as evenly as possible between them all and work as hard as I can when I need to. 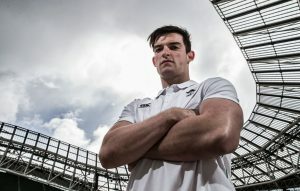 Having completed his Sports Science degree at UCD, Daly set his sights on making inroads in Dublin. The awarding of a senior professional contract in 2016 heightened his prospects, while some promising form ahead of 2017/18 suggested his turn was imminent. However, damage to his ACL placed a steep roadblock in his path. A long period on the sidelines awaited. “Physiotherapy was always something I wanted to do, probably only once I retired. But with my injury last year I was going to miss the majority of the season. I decided it might be a good time to get some modules done. With the help of Ella McCabe and Rugby Players Ireland I applied, and we met with UCD so we could make a plan that we could fit in around my training schedule. 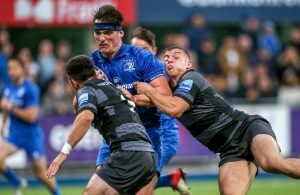 Out of action for a year, Daly returned to Leinster action in August. Standing at an imposing 6’4’’, the centre operates both as a physical ballast and creative influence in the midfield. Never far from the action, Daly has also never been far from injury. But even in the most challenging of circumstances, he manages to see a silver lining. The same applies to Daly’s life. Rugby, studies and even fitting in time to get home to his parents in Carlow can prove to be a struggle. However, the Goodbody Rugby Players Ireland Bursary may prove to alleviate some of those challenges.